1. Preheat the oven to 180ºC, gas mark 4. Grease and base line a 1kg loaf tin. 2. Steep the tea bag in 150ml boiling water for 5 minutes, then remove the bag and pour the tea over the sultanas and allow to soak. 3. Whisk the eggs, honey and sugar together in a large bowl until pale. Mix the flour, baking powder and spice together and fold into the egg mixture. Finally, mix in the sultanas along with the liquid. 4. 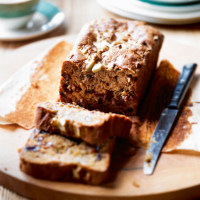 Grate 1½ apples and stir into the cake mixture, then pour into the prepared loaf tin. Dice the remaining apple into small pieces and scatter over the cake. Bake for 50–60 minutes or until cooked throughout.